The overall banking business model is simple. Banks receive money from clients which are depositors and the capital markets and lend to other clients which are borrowers, therefore banks make a profit from the interest spread. If a bank borrows money from a depositor at 4 percent and lends it out at 6 percent, the bank has earned a 2 percent spread, which is called net interest income. Furthermore banks also earn money from basic fees, assets under management (AUM) and other services, which is usually referred to as income from fees and commissions or simply noninterest income. If we combine net interest income and noninterest income we end up with the net revenues of a bank or its top line. A further point which is less obvious is that consumers are actually paying for the liquidity services as well. The center of banking is, due to my experience of working for a bank, one thing: risk management. Banks have to deal with three different types of risk: credit, liquidity also known as “Fristentransformation”, and the interest rate environment. Borrowers and lenders pay banks through interest or fees because they are unwilling to manage the risk on their own, or because banks can do it more cheaply. There are only a few other business in the world where you can take money from people and effectively charge them to take it off their hands. That’s the banking and insurance business model in a nutshell. But there are many banks, asset managers and insurers out there, most of them in the same country and the same business segment and after all, financial products and services tend to be generic. Despite this fact most of the banks and the finance industry earn some decent returns for themselves and their investors, which is a first sign of a potential moat. For this reason today we would like to show you what makes the overall industry special, which economic moats we can find and what makes one bank better than another. We will share our investment thesis of one of the best known and exclusive banks in the world; No, we are not talking about Goldman Sachs or Deutsche Bank, we are talking about a family run business which has its roots over 250 years ago. We are talking about Banque Privée Edmond de Rothschild (BPER in the hereafter). Banque Privée Edmond de Rothschild ISIN: CH0001347498 is founded in the year 1923 under the name Banque Privée. Banque Privée was bought and transformed in the year 1953 from Edmond Adolphe de Rothschild, and is since then in the hand of the Rothschild family. 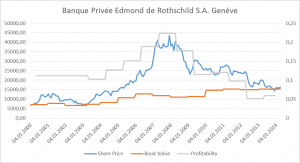 The share capital of Banque Privée Edmond de Rothschild is CHF 45,000,000 divided into two parts: 200,000 registered shares with a par value of CHF 100 each, and fifty thousand (50,000) bearer shares with a par value of CHF 500 each. Each share, regardless of its par value, has one voting right. The 200,000 shares with a par value of CHF 100 each are unlisted and fully in the hand of the family, which allows it to take full control over the day-to-day business. So the overall outstanding Shares amounts to 90.000 bearer equivalent shares. The Major Shareholders of the company are the Edmond de Rothschild Holding S.A., which is fully controlled by Benjamin and Adriane de Rothschild with 81.4% of share capital and 86.9% of voting rights respectively and the Rothschild Holding AG Zurich with 8.4% of share capital and 9.4% of voting rights. So overall 89.8% of share capital and 96.3% of the voting rights are in the hand of the Rothschild family. Benjamin de Rothschild is in charge since the year of 1997. Over the last fifteen years under his leadership, BPER was based on powerful drivers. During that period, the Group had increased assets under management by a factor of five and its workforce and sites worldwide by a factor of three. The Company established a long-term personal private banking relationship, by dedicating time to listening and offering personalized advisory services based on specific knowledge of each client’s situation. Benjamin de Rothschild has four daughters from which one will lead the bank one day. This is in my experience a positive aspect due to the fact that woman normally tend to be more risk averse than men. If you take a look into the annual reports and only read the statement to the shareholder which is written by the Benjamin de Rothschild and the CEO you can clearly see how good and with which long-term perspective this company is managed. They invest heavily into the long term opportunities like the new branches in the Middle-East and Hong Kong which have an attractive geopolitical position. For this reason they are beefing up their asset management department in the emerging markets. The client relationship management is presented in each branch whereas the money is transferred to Swiss and Luxemburg where it is managed by the bank. So we can observe a network effect of branches which leads to more and more Assets under Management on accounts in Switzerland and Luxemburg which are related to the bank. The geographical expansion is next to an overall wider product range for the clients the key for the strategy to foster growth and Assets under Management. More Assets under Management mean also more Income from Fees and Commissions which stand for 77% of overall income. Furthermore Income from Fees and Commissions are normally more predictable and higher than the income from interest spreads which has fallen in the last years due to the low yield environment. A Google search of Baron Benjamin de Rothschild produces little in the aspect of information. Baron Benjamin de Rothschild rarely gives interviews; there are a handful of articles about him in the French press but none in the English-language media and certainly not in the Israeli media. Overall he seems to be a shy man, you can’t find a lot of photos of him. This is a fact we normally like because we don’t think that the people should spend their time with sell side analyst or media correspondents, this is an important outsider aspect for us. Another important fact is that it seems like the bank has never followed the ‘stop and go’ method – meaning recruitment and dismissals according to the state of the business – as other banks do. The company never laid off employees which is in our opinion a positive aspect. Instead they invest heavily in long-term opportunities and stay away from acquiring new clients throughout costly acquisition of other private banks or divisions from competitors. This hurts the short-term profits of BPER but will increase the long-term profitability of the bank. According to him, Benjamin de Rothschild spends 90% of his time developing the long-term strategy of BPER. The only thing that made us worry a little bit, is that he seems to be a chain smoker and a lover of quick cars, both of which are not necessarily beneficial factors for a long live. Furthermore, Christophe de Backer seems to be a good CEO with a clear long term strategy for BPER that should increase the AUM to around 150 billion CHF in the next couple of years. Before he joined Rothschild, de Backer was the CEO of the private banking division of HSBC and successfully streamlined its operation in France. One of his goals is to bring the Cost-Income Ratio to 66% in the year 2016. The banking industry itself is highly diversified, you find well-known brands of retail banks like Deutsche Bank, Commerzbank etc., in nearly every city and furthermore there are specialist for nearly every kind of transection. In the private banking industry which deals with affluent clients you can observe fewer competition and overall a lower number of competitors. Normally you have some local players in each country, in Germany for example banks like Weberbank, Bankhaus Lampe and Merck & Finck, furthermore you can find a couple of bigger players which have branches in more than one country. In the next chart we have divided the field of competitors into Universalists and Specialists and ranked them according to their minimum requirements in terms of net worth per client. What you can observe is that there is less and less competition in the higher costumer segment of ultra-high net worth individuals. For BPER we find only two real competitors, Julius Bär with round about 240 billion CHF AUM and Pictet with around 390 billion CHF AUM. Furthermore there are a couple of smaller regional banks and a hand of bigger and global private banks like UBS, Credit Suisse etc. which are competing in lower costumer segment. In the next Graph you can observe the net liquidity requirements of a couple of different banks. What you can clearly see is that BPER has with 3 Mio. CHF in net liquidity the highest requirements, this is by far more than the 500.000 CHF of Julius Bär. 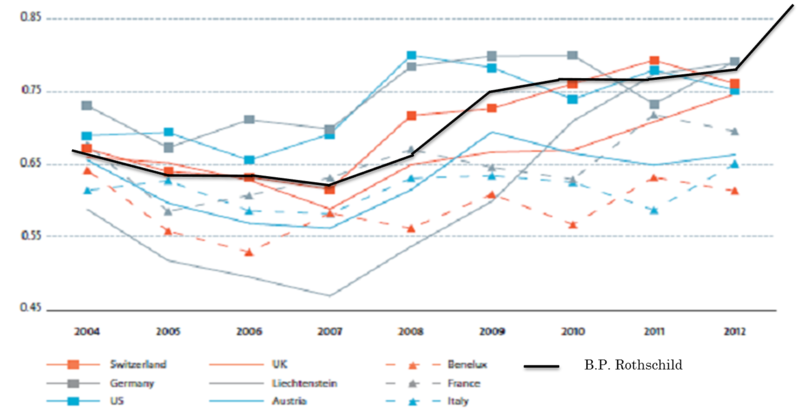 Due to the fact that the only real global competitors for ultra-high net worth individuals of BPER are Julis Bär and Pictet, we think that these are clear signs of a moat. 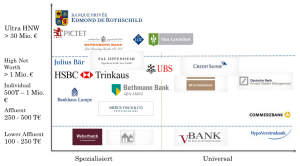 Pictet is over 200 years old, has 390 billion CHF AUM and is privately held. In the next table you can observe the actual P/B of BPER and three different competitors which are public traded. Julius Bär is the biggest, in terms of AUM and highest priced bank which has grown mainly by acquisitions, which are in long-term normally costlier than organic growth. BPER has clearly the highest RoE, RoA and BIS Ratio in the group which normally leads to a higher Multiple but this is not the case for BPRE. How Does the business Work? 1. Huge balance sheet requirements: there is probably no industry that is more capital-intensive than banking or, more generally, financial services. 2. Large economies of scale: banking offers huge economies of scale, in costumer relations, network, branches and transmission systems. This has been a driving factor behind the industry’s pervasive consolidation, “with the number of U.S. banks declining by 44 percent from 1980 through 2001. Employees of larger banks were responsible for nearly double the assets on average, but big banks are normally also better at squeezing their customers’ assets for more revenue through fees. 3. A regional oligopoly type industry structure: the industry has become very concentrated on a regional level, with the biggest banks in individual countries often operating as difficult-to-penetrate oligopolies. 4. Customer switching costs: banks tend to have very loyal customers. U.S. Bancorp, Wells Fargo, and other large retail banks estimate that attrition runs at about 15 percent per year. In other words, 85 percent of accounts— and, therefore, revenues—recur every year, a pretty sticky business. For private banks with high net worth clients the numbers are even higher. This is partially due to branding and the desire to stick with the firm you trust. Equally important is inertia. Most people don’t switch banks, even if they feel that they’re being nickeled and dimed by their current bank. For instance, a 2001 study found that 38 percent of checking account customers didn’t recall the last time that the price was raised on their account. Of the remaining 62 percent, only 4 percent of those people moved banks because of the higher fees. A good thing (for banks) is that the clients normally don’t see on the first glance what they pay for the delivered service. That is because the costumer has to pay the service with commission and fees which are priced into the product. Furthermore the costs of the products and services itself are relatively small in the overall cost structure of the client. The costs for a client are around 70.000 Euro a year, if you have 30.000.000 Euro, the client spends only 0.23% in costs for the service which is provided by the bank. So what are the real costs for a typical client of such a bank? We think it’s time and time is money! We like to think of banking as a very close long-time relationship. First of all you have to establish trust and a deeper understanding of the family and wealth structure. This normally takes several meetings over a couple of months and leads to several hours of meetings, we estimate that it needs around 50 hours to establish one client relationship. 77% of BPER`s operating profit is related to Commission income on securities and investment transactions. This heading covers brokerage fees, custody fees, management fees, advisory fees and commissions on investment activities which are mainly income from the management of investment trusts and is normally a relatively steady stream of income. We think that we observe historical high cost-income ratios at the moment which will normalize in the long-run. 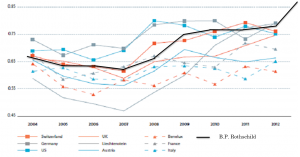 In the next chart we compare the cost-income ratio of different countries with the actual cost income ratio of BPER over the last 10 years. What you can observe is that the overall ratio has increased heavily after the year of 2007, this is partly due to an increase in regulation and mainly due to the opportunistic investment in new branches and new employees by BPER. In our opinion these investments will lead to a stronger profitable growth in the near future. The opening of new branches does not lead to increasing fixed assets but to higher personal expenses. For example BPER increased its staff from 1277 in the year 2007 to todays 1805 which leads to an increase in costs and employees of over 35% in 6 years. The increase in employees is mainly related to the opening of the 4 new branches. 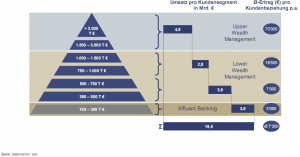 Every new employee is related to a costs increase of over 300.000 CHF. In the same time BPER established new branches in Tel Arive, Dubai and in Asia where, according to a McKinsey report, we will observe strong growth in wealthy entrepreneurs. For example the number of people with more than 100 Mio. 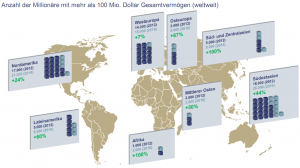 Dollar in net worth will double from 4.000 to 8.000 in the next 3 years. The overall market for private wealth management is assumed to grow in the high single ditches over the next century. Our analysis of the market in the industry overview section clearly shows that we see an overall low competition due to the relatively small number of global key competitors in the market for ultra-high net worth individuals. Does Rothschild have a Moat? We think so. In our opinion the moat lies in the brand name of BPER and the overall high switching costs for the clients. Furthermore the overall price for the service is quite small to the overall income of a client, which we consider as ‘little price, big pain’. A clear moat for us is the incredibly strong brand name of the bank which immediately creates a picture in the head of every costumer or knowledgeable person. The Rothschild family is over 250 years old and has built itself a reputation for incredible power and wealth. They overcome the Napoleon War, the first and second world war and still prosper. The brand name is furthermore well protected, because of the fact that the head and main shareholder of every institution which uses the name Rothschild, has to be a Rothschild. Therefore no other bank can use the brand if it is not under control of the family. The different clans of the Rothschild family have divided their footprint a long time ago and stick to this deviation since then. The M score reaches from 0 to 10 whereas 10 is a company like Coca Cola and 0 is more like a simple trucking/logistic company which only earns 1-2% on its assets. We think that BPER has a medium size Moat, because customers cannot switch to another bank easily after they opened an account one time at BPER. Furthermore the overall switching level in the banking industry itself is quiet low and even lower for private banking clients. Additionally the overall cost which occur every year for a client are far below 1% of his overall wealth and far below 5% of his annual income. For me Rothschild is a company which scores around an 8 on the M score. Is there a Qualitative Evidence of a Moat? At the first glance no, because there is only a Return on Equity of 5.9% this year and a Return on Assets of only 0.4%. But if you dig a little bit deeper into the historical numbers you can observe a far higher return on both numbers. If you take a look on the 10 year time horizon the Return on Equity of BPER is on average 13% per year and the Return on Assets around 1.4%. This returns are respectively double and triple as high than the actual returns. Sure, like always there is some risk in every business. For BPER a major risks is compliance with the local tax rules, CD`s with client information and the risk that some advisors leave the bank and take their clients with them. Since the 2012 the relationship managers have to ensure compliance with local tax rules. This is also controlled at the systems level. In a broader scheme of things, requiring tax compliance means changing the business model of many Swiss banks and wealth advisors. But this allows BPER to emphasize other value-added services, such as wealth planning into their overall service. Furthermore for every bank the risk of the loan portfolio is important. When we looked for clear evidence that the credit culture is sound, conservative, and has been tested over the last couple of years we used the numbers of non-performing loans, charge of rates. The good thing about BPER is that they are a private bank which does not give out unsecured loans, this leads to an overall much smaller loan portfolio of BPER and its high BIS ratio of 36%. In the chart which follows hereafter you can observe that the delinquency rates of BPER are quiet low and did not spike significantly over the years 2007-2009. In general the impact of rates on banks is often oversimplified to “Higher rates, good; Lower rates, bad.” But this does not hold for Rothschild. To understand why banks aren’t entirely at the mercy of prevailing interest rates, consider how banks report their revenue and income. Unlike traditional firms, there is no explicit “revenue” or “sales” line. Instead, there are four major components to examine: (1) interest income, (2) interest expense, (3) income of fees and commission, and (4) provisions for loan losses. Thus, while margins can be impacted by interest rates, BPER achieves round about 77% of its income by income from fees and commission, which are normally more reliable than income from interest. Additionally we checked the personnel welfare plans, which showed a funding ratio of 93.4% with a 1% interest rate on vested assets, this reflects an overall well founded welfare plan with low interest assumptions. The shareholder equity amounts to 8.8% of the balance sheet total, which can absorb some shortfalls. We don’t think that the competitive landscape will see a big change in the future, we will perhaps see a future consolidation in the overall number in market participants and an increase in competition for the best talents. Overall we think that the treat via tax laws and regulation will stay at the actual level, which can help to push smaller regional players out of the market. BPER has decided to file the Category 2 standard for banks under the US Tax program, in line with the recommendations issued by our regulator (FINMA). This does not imply any problems with tax issues in the past and can be seen as an act of prudence. How much would we, after this short summary, pay for BPER? BPER is trading around Book value, (1.1), furthermore BPER achieved a RoE of 5.9%, which is significant less than in the years of 2006-2009 (<13%). We hope and think that BPER can return its profit margins back to the old levels. Therefore we think that BPER is more worth than the actual share price of 16300 CHF. But how much more? So let’s start with a peer group valuation. The problem with this is that the many other private banks are not publically listed and other banks had lost significant amounts of money and trade therefore at really low multiples which makes them inappropriate for a peer evaluation. We decide that we use the multiples of P/B, Assets under Management and efficiency ratios for the year 2014. The value of private banks is mostly calculated as a percentage of their AUMs. If we use conservative 2% of AUM as a proxy, we end up with an equity value of 2.17 billion CHF or 24.134 CHF per share which implies a Margin of Safety of 41%. If we use 5% of AUM as a proxy for the fair value of the company we receive a fair equity value of 5.43 billion CHF or 62.000 CHF per Share a Margin of Safety of 132% which is, in our opinion, a too high approximation. If we compare BPER against Julius Bär (you have to remember that BPER has a higher BIS Ratio and a higher profitability) and use a 1.9 P/B as multiple we end up with a fair share price for BPER of 29.000 CHF per share. Furthermore BPER is in the strong position that the assets under management grow in average with over 6% p.a. 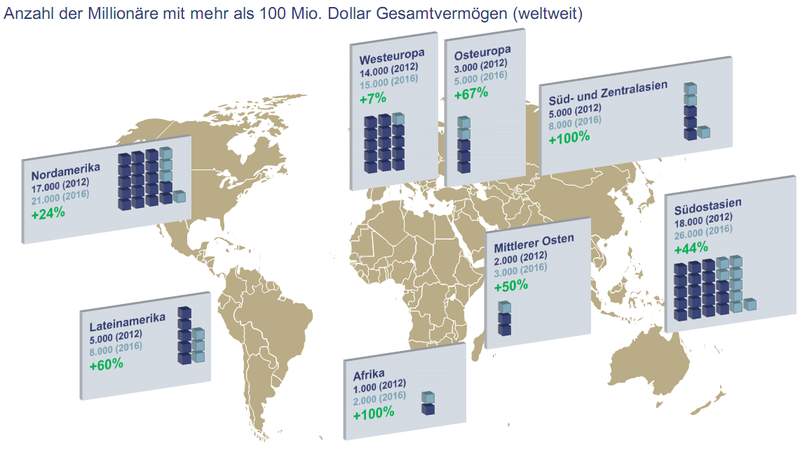 (currently 108.6 billion CHF), which will increase in our opinion when the new branches are fully on track. Additionally the net profit was up this year to 75.4 million CHF, which was an increase of 13.6%. The rise in profits were explained by the expansion of the business segments and a strict cost control which will continue into the near future. The Return on Equity and the Return on Assets are the de facto standards for gauging bank profitability. Generally, investors should look for banks that can constantly generate mid- to high-teen returns on equity. What you can observe in the next chart is the development of the ratios according to Bloomberg. When the net income reaches the average RoE of 13% we will reach over 1.000 CHF in earnings per share, but it can be very easy to boost bank’s earnings in the short term by under-provisioning or leveraging up the balance sheet, which can be unduly risky over the long term. “For this reason, it’s good to see a high level of return on assets, as well. For banks, a top ROA would be in the 1.2 percent to 1.4 percent range.” The average RoA of BPER is respectively 1.4% with which we can easily see earnings per share of over 1.300 CHF per share which would imply a P/E of 9 and less for such a high quality business. The higher RoA result in the RoA of BPER is due to the fact that it has relative high amount of equity on its balance sheet which depresses the RoE of BPER but is much more conservative than many other banks. Assuming the assets and liabilities closely approximate their reported value, the base value for a bank should be book value. For any premium above that, investors are paying for future growth and excess earnings. Typically, big banks have traded in the two or three times book range over the past decade; regionals have often traded for less than that. But you have to remember, there is almost always a reason that a company is selling at a discount, so be sure you understand the reason which we will discuss in the hereafter. In my opinion this is due to the fact that the Rothschild family owns over 89% of the outstanding stocks which leads to the fact that there are roughly 9.000 shares in the free float. This leads to a possible investment of approximated 145 Mio. CHF, which is rather small for bigger funds. Additionally the average trading volume lies around 6,5 shares per day, which leads to a highly illiquid investment what is normally avoided by all sorts of funds. Additionally the ex CEO has retired after 21 years in charge and has sold 550 shares of BPER which is quite a lot for an average trading volume of only 6,5 shares a day. The last point is in our opinion the high share price which will prevent many people to invest into the stock. He argues that most operations fall in some middle ground, in the sense that they are either a weak franchise or strong business. A franchise can price its products aggressively and still earn high rates of return on capital. More importantly, franchises can tolerate mis-management. Large economies of scale in the business derived from having an established distribution- and back office-network. The high regulation standards of the industry which do not affect the pricing power of BPER in the long-run. The capital-intensive nature of the industry banking itself. The high Customer-switching costs in the banking industry itself and private banking in particular, or why do we stick in average over 7 years to one giro? Additionally the price of the product is miniscule in terms of the overall cost of the client and the client has not to pay them as a bill. In our opinion we can observe that the credit culture of BPER is sound, conservative, and has been tested in the last couple of years. Furthermore Rothschild has an even stronger economic moat, which lies in its over 200 year old brand and family name and it’s absolute focus on a profitable niche with even higher costumer-switching costs. In our opinion BPER is a medium size Moat investment which should be worth around 25.000 CHF per share without any future growth, this implies a margin of safety of roughly 50%. Furthermore we acquire a growth opportunity on the overall increase in wealthy persons around the world and especially in Asia which should be worth something. A question: What is “Other amounts due to customers” which comprise 87% of the total balance sheet? How diversified is it between different customers, and what is the average cost of it? A second question: management says that the decline in net interest income is due to “very low interest rates on money markets and our highly conservative policy on investing surplus cash”. Isn’t this investment in fact a bet on higher interest rates in the future? the amounts due to customers, are normal bank deposits and normaly BPER can charge a margin on this. But this time is different and interest rates are quiet low. So you are right with your intention that if we see higher interest rates in the future BPER will earn a higher margin. But this will not be the case for a long time. If you take a look into the report you will see that over 50% of the revenue are fee relate and are generally more predictable, this is what we like. I will come up with an additional post how we value the potential growth of Rothschild. 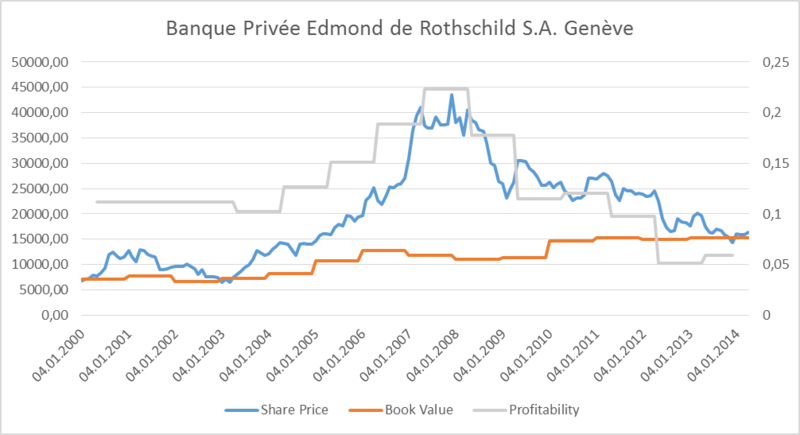 As Benjamin de Rothschild holds 96% of the BPER, and the Articles of Association invalidate the minority stake’s protective mechanism against takeovers, as stated above, what guarantees the individual investor that Benjamin de Rothschild won’t just lead to a decline in the share price, as happened already by the way, and then pickup the rest of the shares traded in the stock exchange for the quoted price? thank you for your questions I will come back to them in a couple of days, I’m really busy at the moment due to the fact that I have my CFA Exam on saturday. Don’t forget that the english arm over paris orlean has 9% of the company. The main point is actually why they came public, I think there is a good paragraph over this topic in the 2008 MD&A. If you have more questions, ask them! I will all answer them after the exam. thanks for your questions, I appreciate them due to the fact that they give another opinion and further thoughts. First of all I have read a statement of Baron Benjamin de Rothschild which said that they follow the public listening of the stocks to give transparency to all their clients and this was already the intention of Baron Edmond de Rothschild. current crisis through massive injections from new shareholders–often from sovereign wealth funds or national governments. Our Bank, by contrast, would lose its soul without its main shareholder, who across the generations has given it his name, his culture and his tradition. Our senior managers, who also have a stake in the Bank’s share capital, keep a watchful eye on our shareholders’ equity. Embedded in it is an essential asset: the name borne by all of our Group entities. And embedded in the name is our reputation, which after 250 years remains intact despite revolutions, wars, waves of persecution and stockmarket crashes–damaging in their own way.”), than page 8 of the one of 2007 and page 7+8 of the annual shareholder letter of the year 2012. Furthermore I can only recommend this interview, where you can also see some aspects which I personally don’t like. I will also approach Mr. Leuthold with the question regarding the squeeze out. As a matter of fact, I’ve already read all of the materials mentioned in your comment, unfortunately leaving us without a remedy to our dire concern – what if Benjamin de Rothschild would want the public out (as he does seem to be an introvert person) – no one to criticize, no one to ask questions, no one to take his opinion into consideration; and it’s not like BPER will lack any liquidity in the foreseeable future. One could buy the stock today, having its price decline by, say, 20% in a year from now, while Benjamin de Rothschild keeps buying the remaining shares from the public, until he has more than 98% of the company. Then B.d.R could apply by Art. 33 of SESTA, and just ask the court to cancel the remaining shares in the public’s hand, which B.d.R would have to compensate by paying the higher amounts between the two: a) share’s market price; or b) highest price B.d.R has paid for BPER share over the last 12 months. This scenario could well leave the individual investor with a net loss of 0-20% over a year or so. 10x Nils. I’ll see about the 2008 MD&A while waiting for your comments. Good luck with the exam. I believe that it is cheap and you get the discount because of the liquidity issue. They are riding the continuing trend of investors seeking asset managers rather than “do it yourself” or tips from commission brokers. Swiss investment managers are still recovering from tax compliance. Leichtenstein Landsbanke is a similar example. I suspect they will all recover as they offer a history of prudent investment and moderate growth. The emerging weath from developing nations will recognize the needs for this service.